Happy 2014! I hope the holidays treated you well and you're not too tired of the kitchen. I somehow managed to come out of it alive, albeit with a few pounds to spare! Despite all the dietary resolutions floating around out there today, I'm not giving you a recipe for kale or spaghetti squash. That's not to say I'm not reining it in around here too, but I feel like you probably need a little bourbon in your life all year long. A few weeks before the holidays I was gifted (well, swapped!) a couple different homemade bitters from Kate at Snowflake Kitchen which inspired me to come up with something a little different to mix up and sip on. The vanilla maple coconut bitters included in this recipe are super yummy and add just a little extra suntin'-suntin' to the overall flavor of this drink, but if you don't have the time to whip up your own you can swap them out for another variety of bitters. 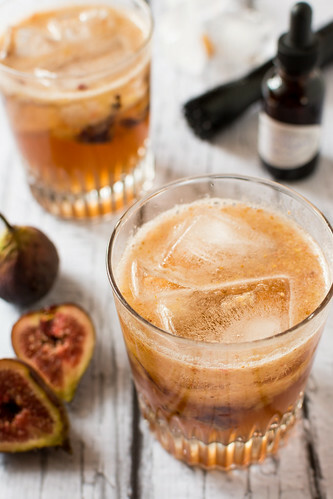 And if finding fresh figs at your local grocery store is hit or miss around you as it often is for me, you can make the fig-infused bourbon with dried figs, omit the fresh fig in the muddling step and still have a lovely figgy cocktail! 1. Fill your mason jar, or other container, halfway with fresh figs. Top off with bourbon, cover, and let sit for 5-7 days, giving it a gentle swirl once a day or so. Once infused, strain the bourbon through a sieve (reserve the figs for another use like a boozy jam) and pour bourbon into another clean jar for storage. 1. Divide the fig between 2 old fashioned glasses. To each glass add 1 tsp maple syrup, small squeeze of fresh lemon juice and a couple dashes of bitters. Muddle ingredients in each glass until well incorporated. 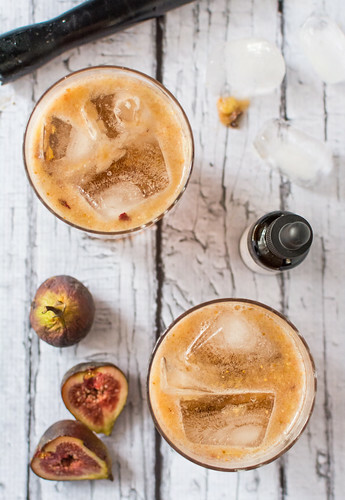 Fill glasses with ice, pour 1 1/2 oz of the fig infused bourbon over each and then top with ginger beer. Give a quick stir and enjoy! It's breakfast time but now I want one of these! ;} tick tock…. Awesome :) It should be up within the next few weeks. I'm in love! Bourbon, maple, and fig are some of my favorite flavors! Just did some fruit soaked with bourbon in mason jars- i'll have to throw in some figs! Candid Wedding Photography Sydney is a great way to document what may well be the most important day of your life.